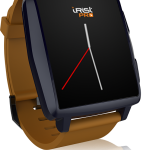 The Intex Irist Pro is a generic smartwatch compatible with Android 4.4 and above devices. You can control the watch with gestures, by doing things like shaking your wrist to answer a call. It can receive remote notifications, calls, alerts, and more. It�s running a proprietary OS with custom apps and software.